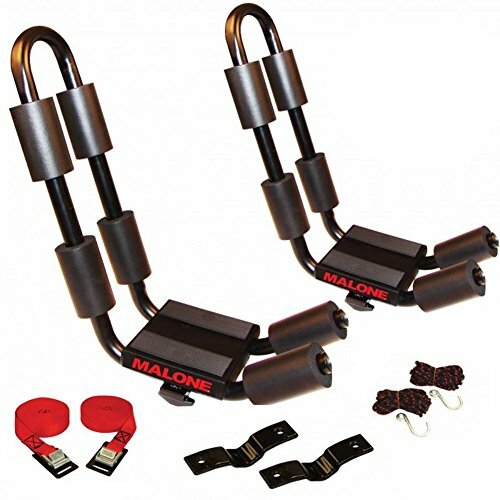 Get on the road to the rapids quickly and easily with this Malone® J-Pro™ kayak carrier! It's crafted from high-quality materials for lasting durability, and features a simple tool-free mounting system. J-style kayak carrier. Tubular steel frame for maximum strength. Corrosion-resistant coating. Tool-free mounting hardware. Adjustable rear padding. Universal fit is compatible with round, square and factory oval load bars. Holds kayaks up to 34" wide and weighing up to 75 lbs. Includes 11' load straps and safety tie-downs. Dimensions: L 16" x W 6 x H 16.5". Lifetime manufacturer's warranty. Made in China. If you have any questions about this product by Malone Racks, contact us by completing and submitting the form below. If you are looking for a specif part number, please include it with your message.